Like many other girls when I was little once a week I donned a tutu, leotard and ballet pumps, to perfect my plies and pirouettes at my ballet class, but sadly after starting boarding school I stopped my classes and haven't danced since. 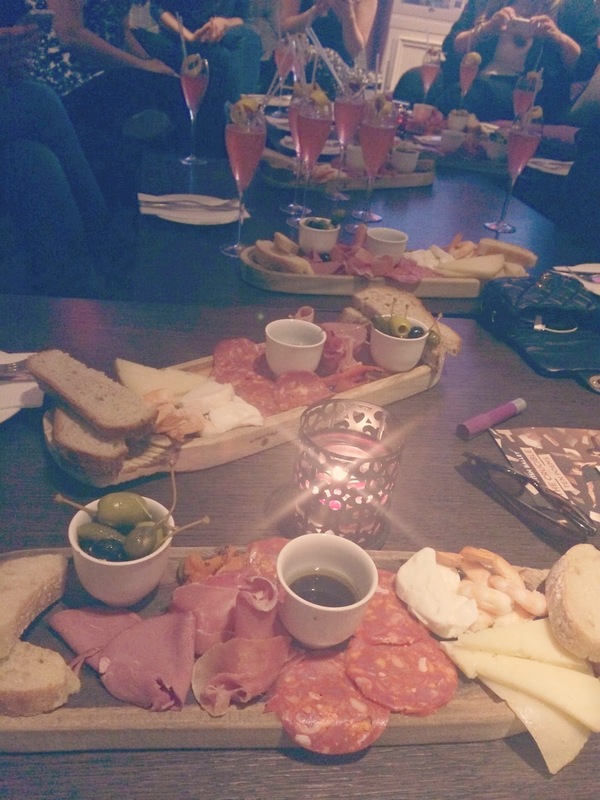 I don't think I was anything to write home about but most importantly I enjoyed ballet, so when an email from Christina at Scottish Ballet landed in my inbox inviting me to a night of witches, hysteria and tapas, it was no surprise I was a definite yes! Truth be told I'm often put off going to see the ballet as I wrongly presume that the majority of ballet on offer is very traditional Swan Lake esque productions which though beautiful, sadly don't overly excite me... Step in to the spotlight; Scottish Ballet, who are well known for pushing the boundaries and reworking classics and making them their own. This Autumn Scottish Ballet are presenting a double bill of Arthur Miller's classic play The Crucible alongside Ten Poems by Dylan Thomas. Luciana Ravizzi and Andrew Peasgood for Scottish Ballet’s 2014 autumn season, a double bill of Helen Pickett’s world premiere The Crucible and Christopher Bruce’s UK premiere Ten Poems. Scottish Ballet's multi-award winning 2012 production of Tennessee Williams' A Streetcar Named Desire, was praised for it's edgy, vibrant approach to the well known play, is still often talked about and their Autumn adaptation of The Crucible and interpretation of Ten Poems looks set to be just as impressive. Our evening of mystery, witchcraft, cocktails and ballet chat provided the perfect opportunity to get an insight into how Scottish Ballet decide which works to perform, their inspirations and of course have a good catch up with some of my fellow Scottish Bloggers, can't complain really. After a 90s flashback watching The Craft at The Glasgow Film Theatre we headed along to the sumptuous surroundings of Blythswood Square for cocktails and antipasti while we heard from Miriam, one of the education officers' from Scottish Ballet. The Pink Swan cocktails which had been created exclusively for us at Blythswood Square were divine combining a few of my favourite flavours; elderflower, raspberry and pear, yum! Antipasti; what a bunch of bloggers we are, you can see everyone snapping away with their cameras! For those not familiar with The Crucible I'll fill you in a little; one of the most famous plays of the 20th Century The Crucible is a partly fictionalised dramatised portrayal of the Salem witch trials, dark material indeed. Scottish Ballet's adaptation of The Crucible presents a dark, bewitching side to ballet, described by one person as "slutty ballet"! Though I've never actually watched American Horror Story; Coven, I imagine that anyone who has would enjoy The Crucible, perhaps not; but the dark, mystery and sultriness of both seem rather similar, and both are firmly on my to-see list! 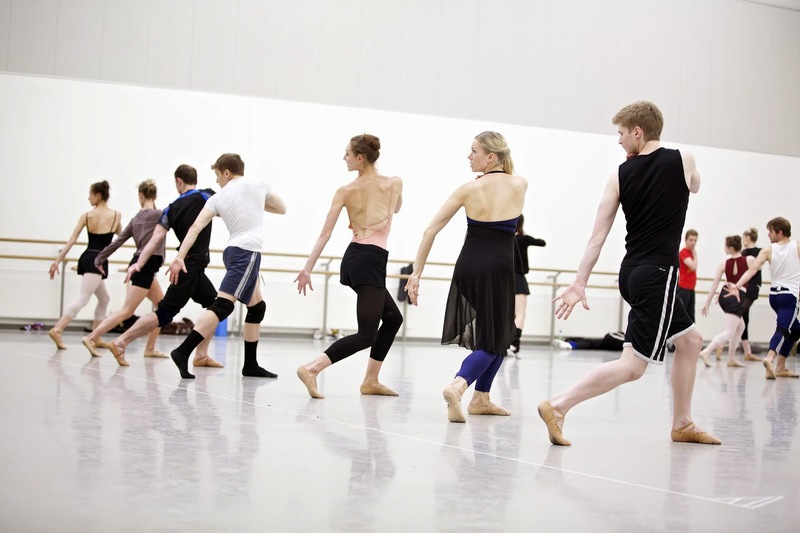 Scottish Ballet dancers in rehearsals for Helen Pickett’s world premiere, The Crucible. Photo by Andy Ross. "Secrets and lies take hold in the small town of Salem when a group of teenage girls claim to have been possessed by witchcraft. But who - or what - is to blame. "A fire, a fire is burning! I hear the boot of Lucifer, I see his filthy face! And it is my face, and yours, Danforth! For them that quail to bring men out of ignorance, as I have quailed, and as you quail now when you know in all your black hearts that this be fraud - God damns our kind especially, and we will burn, we will burn together!" John Proctor, Act III, in court, Pg. 105 (The Crucible, Arthur Miller)"
Sophie Martin in rehearsals for Helen Pickett’s world premiere, The Crucible. Photo by Andy Ross. Featuring rave scenes and music from films such as Behind Enemy Gates and Shutter Island, The Crucible is definitely a must see if you're looking for a new and exciting dance experience, choreographed by Helen Pickett, I can't wait to see The Crucible in full. Perhaps a The Craft inspired outfit will be in order for the evening, continuity and all! 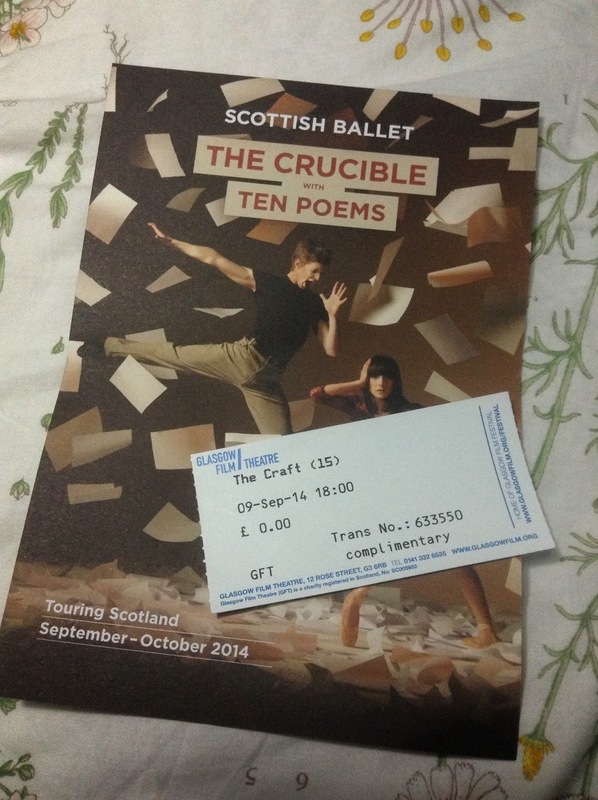 The Crucible and Ten Poems open in Glasgow at the end of this month at the Theatre Royal. So if you fancy an evening of witchery, ballet and poetry, head on over to www.scottishballet.co.uk and why not have a wee watch of the making of The Crucible too! I hope you're all having a fab weekend, I'd love to know if you're a fan of ballet and what your favourite ballet is?